The recall of 8.7 million pounds of beef processed by Rancho Feeding Corporation now covers the entire nation, according to the USDA. The firm processed beef from diseased and unsound animals and did it without any federal inspection. The products are considered adulterated because they are unsound, unwholesome or otherwise are unfit for human consumption and must be removed from commerce. The products have, unfortunately, been made into other products. Nestles recalled some of their Hot Pockets today and beef jerky in Canada has been recalled. FSIS says that the recalled product was shipped to distribution centers and retail establishments nationwide. The updated retail list is now at more than 1,000 locations. Retail establishments may issue their own recalls. Walmart and Kroger have already done so. 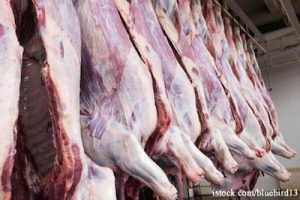 The company is also recalling 30 and 60 pound boxes of “Beef Liver”, “Beef Tripe”, “Beef Tongue”, and “Veal Cuts” as well as 40 pound boxes of “Veal Bones.” Finally, 50 pound boxes of “Beef Feet” and “Beef Hearts” are recalled, as well as 60 pound boxes of “Veal Trim”. The carcasses and boxes have the establishment number “EST. 527″ inside the USDA mark of inspection. Each box bears the case code number ending in “3″ or “4″. The products were made January 1, 2013 through January 7, 2014. No illnesses have been reported to date, but since we don’t know what was wrong with the slaughtered animals, we don’t know what possible illnesses there could be. When we get sick from veggies or fruit, it’s usually a factory farm irrigation running into the veg/fruit farms. Again, it’s the animal farms. I live in Petaluma where the slaughterhouse is located. My friend and I stopped there the day after the first recall and saw a beautiful brown cow with a protruding left eye that was full of and dripping pus and blood, also one with a swollen gland under her/his cheek. They were standing in mud and feces up to their knees. I also know they slaughtered these animals at night, I have a friend that lives up on the hill from there and she said she could hear the animals screaming at night, they had to shut their windows and even then they could hear them. Also, there haven’t been any reports of anyone getting sick because Mad Cow Disease has an incubation period of 3-10 years. Maybe it’s time to seriously consider going vegan.